Are you: An organization committed to Skype for Business but struggling with a few changes it brings the org? A trainer or communicator needing to track attendance and participation for large, live communication/training sessions? An organization with executive or mission-critical meetings that need the assurance of additional support? A project owner responsible for Skype for Business adoption? If so, this case study(-ish) post will share with you a real story of a real client (albeit a client whose identity we’ll protect because that’s the right thing to do in this case). We’ll call ‘em “TheC” (as in, ‘The Client’). Situation and complication: Moving to Office 365 saves money and improves collaboration, but also creates a different problem to solve. Skype for Business and Skype Meeting Broadcast are included with their O365 license. They expected to save big $$$ by replacing two contracts -- both a telecom vendor’s telephony contract and a separate web/video conferencing vendor’s contract for a webinar platform. The challenges they needed to solve then fell into two categories: issues they knew they needed to resolve and those they didn’t. No registration page: Skype for Business has no ability to create a registration page, a typical feature of webinar software. Inadequate reporting: Gathering any data about who attended your Skype for Business/Skype Meeting Broadcast session is not pretty. With Skype for Business this is only accomplished with a complete workaround that involves going into the scheduler/host’s Outlook mail, opening the “conversation history” folder, and manually creating a report of those who attended. With Skype Meeting Broadcast, there is a reporting feature, albeit a limited one with a significant drawback – to use SMB for any session that isn’t by “named invite only,” you must allow anonymous joining. This means you have noinsight about individual participants, including in the Q&A report. Finally, TheC also inquired about “meeting assistance services” for executives when they had more formal and/or mission critical meetings and presentations. They previously had used the “operator assist” service from the telco. TheC decided that, given the scope of what they were trying to accomplish, they would engage us for a 90-day pilot. This engagement, however, was less about “does your (EventBuilder) product work” and more about “how do we manage change within our organization.” TheC had previously hired a separate training/adoption company to assist with rolling out the switch to Skype for Business, but that engagement was of limited duration. They wanted to build on that work while avoiding asking us to do work that duplicated that effort. Only after we began working with TheC on a pilot program, three other latentpains arose. Limited adoption of SfB: Despite the massive rollout and “training,” most users were using the bare minimum of Skype for Business features. No audience engagement at scale: Skype for Business doesn’t scale large enough for frequent meetings/trainings of 250+ participants. But Skype Meeting Broadcast gives presenters novisibility into the audience during the live event. There is no list of attendees. You can’t tell if anyone has joined live (you literally have to start presenting never knowing if one person has joined you). You don’t see polling, Q&A, or other feedback during the live event. Clunky recording/sharing:Skype for Business creates local recordings which then have to be found, “published,” and then shared in an accessible place. Discovery: What came out of the pilot was encouraging. 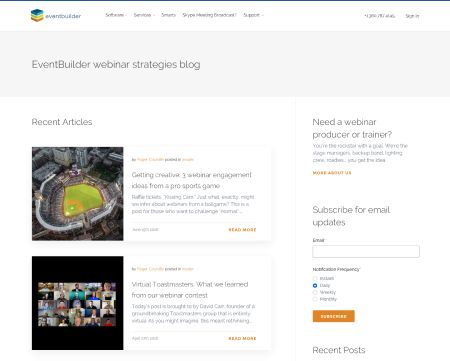 First, as you might expect since we’re shamelessly telling you this story, adding EventBuilder provided the additional features needed to eliminate the extra webinar vendor contract (e.g., registration, scale, advanced polling and surveys, moderator tools, attendee privacy, cloud-based recording, detailed reporting, etc.). Second, TheC had engaged EventBuilder’s Program and Event Managementservices as they were adjusting their own processes for larger webcasts and meetings. What we discovered and adjusted to, in addition to providing event producers to help with specific events was incorporating additional Skype for Business tips into everyday service engagements. More, better data than originally desired. addition to validating attendance of trainees, TheC now had the ability to know when a trainee joined and left, thus improving compliance reporting. Better, they now had a full suite of polling/survey tools to change how they could track engagement. Ability to gather decision-assisting data not previous possible with enhanced reporting both for single Skype for Business and Skype Meeting Broadcast sessions and across multiple sessions. One other thing happened, too: many execs also realized they like the security of having an EventBuilder program or event manager ride shotgun on important meetings and presentations and, despite the fact that they could do them on their own, continue to use our team as an extension of theirs. None of this would happen, of course, if real value wasn’t being created. Of course we share because it’s a success story for us, but more importantly it’s a win for both us and Microsoft because it’s a win for the client who’s now able to redirect the dollars saved to other investments in the organization.